Jonathan Ward has unconventional tastes. 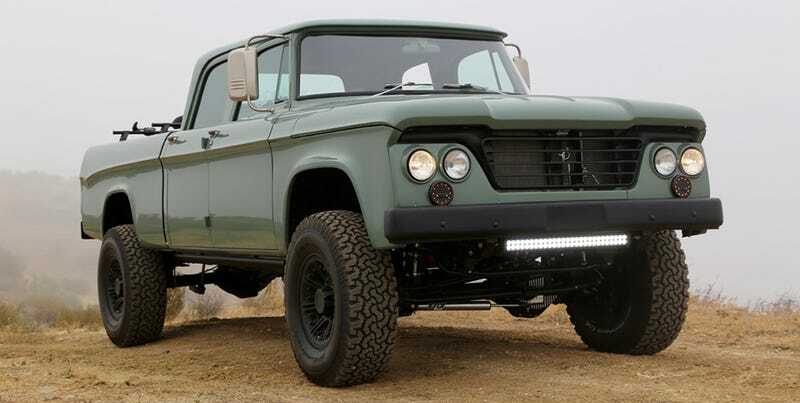 One of those is a deep love for the Dodge D200 Power Wagon, the beefiest, strangest big boy truck of the ‘60s. But he’s not a fan of what’s underneath the freakishly chunky exterior, so he did what any other OCD-addled builder would: he ripped off the body and dropped it on something more modern. This is 1964 model is actually the second D-series Icon has built. The first was a ‘65, and Ward and Co. took the lessons learned on that build to go nuts on this new one. The only thing that’s stock is the body, the door handles, and the seat frame. Everything else has been reimagined, reengineered, and redesigned, and that starts with what’s underpinning it all. The chassis is a 2007 Dodge MegaCab 2500 4x4, with a Magnuson supercharger slapped onto the 5.7-liter V8 and spent hydrocarbons being shoved out a ceramic-coated stainless steel Gibson exhaust. The suspension has been upgraded with Kore-Fox Racing components and the 17-inch Hutchinson wheels are finished in Volcanic Black powercoat and wrapped in 37x12.5-inch BFG A/T tires. Naturally, Icon obsessed over the details. All the knobs are CNC milled, nickel plated and brushed, along with the dash panel, tailgate latches, rear view mirrors, and a few other dozen parts that only Ward would think to redo. There’s an iPad Mini mounted in the center console for navigation and tunes which are sent to the two JL Audio Amps and eight Focal speakers. The interior is made up of obscenely high-end leather that’s been stuffed with Tempurpedic foam, and the carpet is the same Wilton wool you’d find in a Rolls-Royce. Oh, and that hand-carved etching on the rear window is the view from the owner’s ranch at the base of the Teton Mountains. Since the guy that commissioned the D200 can’t just head to Icon if something goes wrong in Wyoming, because Ward used a modern chassis and engine it’s not only reliable but serviceable – all the owner needs to do is either order parts or take it to a dealer.